The international March of the Living has been criticized for indoctrinating teenagers with an anti-Polish narrative of the Shoah. The beginning of the March for Hungarians in Budapest is also criticized, but for making the opposite mistake than the journey to Auschwitz-Birkenau. While the trip is perceived to be filled with too much content, and harmful content at that, the Budapest march is blamed as being void of meaning. I would like to defend it, with a focus on the latest one on April 17, 2016. First of all, I would like to clarify that the present article is not an academic study of the March of the Living phenomenon, but merely a personal reflection of someone involved in Jewish matters and history. I have been going to the March of the Living in Budapest since its establishment in 2003, but I have not participated in the journey-to-Poland part of the program yet. I have been to Auschwitz-Birkenau with my family on a tour led by a very knowledgeable Polish guide who did a splendid job explaining and answering our questions while not appearing to be burnt out or emotionless even though he had been doing this job for years. Yet I felt the tension of being a tourist in Auschwitz-Birkenau. Even though it was not high season, which meant we did not experience the highest possible level of crowdedness, nevertheless, we were part of too big of a tourist group. This meant we had to proceed from one place to another far too quickly to be able to reflect at all about what we were hearing and seeing. After this visit I made the plan to return within the framework of the March of the Living. I felt I missed out on something for not having done this back when I was a teenager. All the information I had about the trip came from friends for whom it had been a very formative experience in their teens, exactly in the way it was conceived by the organizers: it strengthened their Jewish identity and terrified them at the same time, convincing them that they should feel frightened and depressed over the extent of human evil. Therefore, everything I heard from Konstanty Gebert about the Polish and Polish-Jewish view on the March of the Living in the Paideia Paradigm program was entirely new to me and gave me a tremendous amount of food for thought. So did the discussion that followed it, as it engaged several American participants who either had participated as teenagers in the March of the Living or have been suggesting it to their pupils as Jewish educators. What I took with myself is that there was something very wrong with the concept as it entailed presenting Poland as a land of death and murder and the Polish people as inherently hostile to Jews. The beginning of the March in Budapest has a different route each year, which gives it some variety and draws the attention of all the city due to the road closures. It is a celebration of life, involving balloons, music, and fun. In the end of the procession, however, the crowd arrives to a stage set up with the focus on commemoration. Various famous artists, diplomats and clerics give speeches. Since all of them have to evoke the same event and express a similar message, a high risk of repetitiveness is naturally entailed. But this does not necessarily lead to meaningless speeches. Sometimes they are too long and boring, yet in this commemorative context the meaning is not necessarily provided by what is said, but by the fact who says it. Commemorations are rituals, and rituals are not performed for the sake of acquiring new information, let’s admit it. Does one go to church, a synagogue, or mosque liturgies to learn something new? Pretty rarely. Usually one goes for sake of repetition, to listen to messages that have to be expressed and listened to again and again. So, in my view it is normal that the bishops, artists and diplomats say pretty much the same in their March of the Living speeches. They are meaningful because they are messages against racism, anti-Semitism and exclusion; and for human beings who fell victims to these evils - expressed by Christian churchmen, representatives of states and by artists to whom many people listen to. 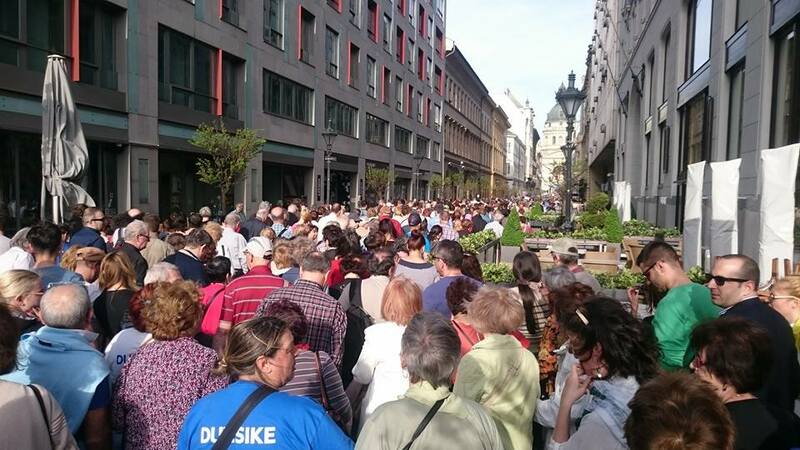 This year twenty thousand people joined the March of the Living in Budapest. The procession went from the Great Synagogue (the one in Dohány street which you probably saw if you ever visited Budapest) to the Saint Stephen Roman Catholic Basilica. This route is in itself meaningful due to the historical relationship of the two “houses of God”. The Great Synagogue of Budapest, Europe’s largest synagogue, was opened in 1859, while the Basilica was only dedicated in 1901. Thus, for many decades the city had a synagogue functioning architecturally as a basilica instead of a church, since the most prominent religious building was a Jewish one. This fact was interpreted in various ways, it supported the Viennese anti-Semitic mayor Karl Lueger’s naming Budapest “Judapest”. I reclaim this expression originally intended as derogatory: yes, Budapest was a city where every fourth inhabitant was Jewish on the turn of the 20th century, where this community played a huge role in building the city. As chief rabbi Róbert Frölich pointed out during the March of the Living, “although the Basilica is only a ten minutes walk away from the Great Synagogue, seven decades ago the cry for help of the Synagogue was not heard in the Basilica”. The speech by Frölich was by no means an empty lip-service to Jewish-Christian interfaith dialogue. He did not only thank the Catholic bishop for joining the March of the Living but also drew attention to the fact that seven decades ago the Catholic Church did not stand up for the persecuted; the Basilica’s gates were closed to the Jewish refugees in 1944. The speakers who represented the Roman Catholic, the Calvinist and the Lutheran churches of Hungary made an effort to bring parabolas and quotations from Rabbinic Jewish tradition, not only the psalms that are usually cited from the Hebrew Bible in Christian contexts. Yet for me the most powerful and meaningful moment was when Roma singer Margit Bangó sang Yiddishe mamme. Her wonderful voice made me feel the pain of the Jewish mother who lost her son in the song’s lyrics. Since all speeches’ and songs’ English translations were screened on the square in front of the Basilica, my non-Hungarian speaker boyfriend and my fellow Paideia alumnus, Benjamin Zagzag, former president of the European Union of Jewish Students, could also follow them. 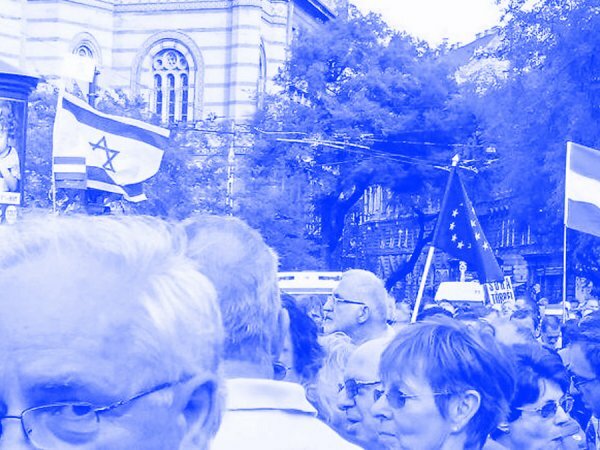 I asked Benjamin’s thoughts on the March of the Living in Budapest, as someone very much involved in Jewish matters but for the first time participating in the March in Budapest. His reaction? He was impressed by the energy this event rose in participants. I definitely belong to those participants who gain energy from the March in Budapest each time, and who think it is too harshly judged by critics. For me, the March carries an important meaning, as it unites the commemoration of the Shoah victims with the celebration of life. Ágnes is a Ph.D. student in History at Central European University (Budapest). She graduated from Paideia's One Year Program as a Moses Maimonides fellow in 2015.